Yesterday, a group of guys from the church started work on the stage to update it. Basically, we’re just organizing wires and adding a couple of steps but it will make the stage more open and more “user-friendly” for the various people that are on it. 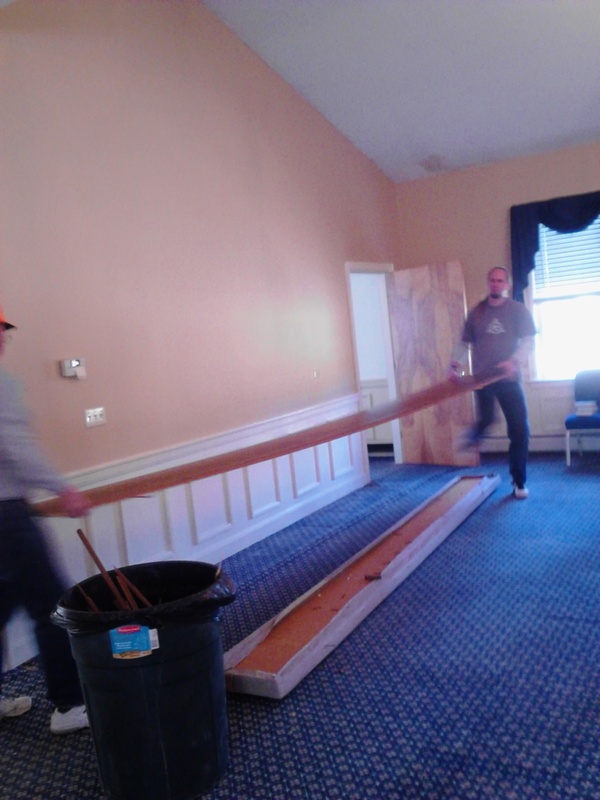 Along the way, Bob (one of our elders) told a couple of the guys to take apart the last pew in our auditorium. It has been sitting there for a couple of years now. It was not removed for reasons unknown to any of us. So, we took the plunge and had it removed. As the guys were carrying the pew away, I was reflecting on how much “church” has changed just in my short lifetime. I grew up sitting on hard wood pews. There was simply no way to sit comfortably on them. Then, in New England I learned that people also have padded pews. As a pastor, I have not led a congregation that had pews. We have always had comfy chairs. Even the fundamentalist church I worked in for several years has chairs now. The strange thing about it is how much people value their seating. Some people love pews. They have a hard time worshiping in a space with chairs. Others cannot figure out why anyone would want to sit in pews when chairs are available. In reality, worship is not something we did sitting down for the first 1500 years or so of the church. Worship was done standing up, and in the medieval church there were not any chairs in church buildings. It was only later, when the focus of worship shifted to the lecture (or sermon if you prefer the religious vocabulary) that seats became a mainstay of congregational worship. And even then, the pews were intentionally designed to be uncomfortable so you would not come to church to feel homey. Now, we spend far more time sitting than we do standing. I am all for the nice, comfortable chairs; but I wonder if we do not rob ourselves of the readiness to move and act by sitting all the time. This is one of the reasons I adopted a standing desk for my office. I want to be moving all the time, whether I am preparing a sermon or simply writing a blog entry. What do you think? Do you think the church should be sitting or standing? Interesting. Never thought of a standing desk. In general I think we are not “bodily” enough in our worship. However, one thing that helped balance my perspective was having disabled individuals in our congregation. Then I realized that a lot of our elderly congregants who were relatively high functioning were still in chronic pain. I think the balance is freedom for everyone. But it’s hard to create an environment where everyone feels truly free to worship in the way that they need to. Thanks for sharing. We also have some elderly folks, and we invite them to adopt whatever posture they are comfortable with. Most Orthodox Churches (from what I am told) still don’t have chairs/pews (except for a few along the perimeter for elderly people or those who are new to the worship) and the ones that are incorporating pews are utterly despised. I like the idea, I feel much more alert when standing or in some sort of meditative posture in which I keep my spine erect. It probably makes sense in a more liturgical setting as opposed to the lecture-driven ideology (as you mentioned) I’m thinking?